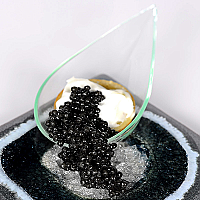 For a long time caviar was a delicacy for millionaires. It does not only have a unique taste but it also shows your status. Nowadays caviar becomes more available and affordable. You сan always find something for a reasonable price. However some of its types (like Golden Caviar or Royal Caviar) are still the most expensive and exclusive. Nevertheless every palate can afford himself this delicacy and furthermore must try different kinds of caviar as an appetizer or side dish.